Native Species should be supported, not evicted! Nov. 26, 2018. The River Otter currently living in Dr. Sun Yat Sen Garden, a Vancouver Park Board Park, should be left unmolested by humans! The current plan to trap and relocated a native species from a Vancouver Park Board public park must be stopped. Native wildlife should be supported, not evicted, from our parks and waterways. The mock concern of Dr. Sun Yat Sen Garden's employees for the koi is hypocritical, given their lack of care for the fish over the decades, resulting in die offs due to preventable habitat conditions, including when I was a park commissioner from 1999-2002. During my term I had to hire an outside company to try to save the resident koi from death because the garden was too cheap to allow greater water flow which was needed to up the oxygen content in the koi ponds at the time. Given that the larger older koi all died off at the time I would find it improbable that the garden now has a 50 year old koi at this time, unless she was added after the big die off and was already quite old then. Regardless, native wildlife, given all they have to contend with from humans...habitat destruction and so on, should not take back seat to introduced species, particularly ones placed there by humans deliberately. I would much rather see a native river otter in a Vancouver Park than a fancy goldfish. As a former park commissioner for the Green Party I find it outrageous that the current board has not put a stop to this violation of a native species' attempt to survive amid the urban infrastructure. Who are WE to say he or she would be "better off" elsewhere? 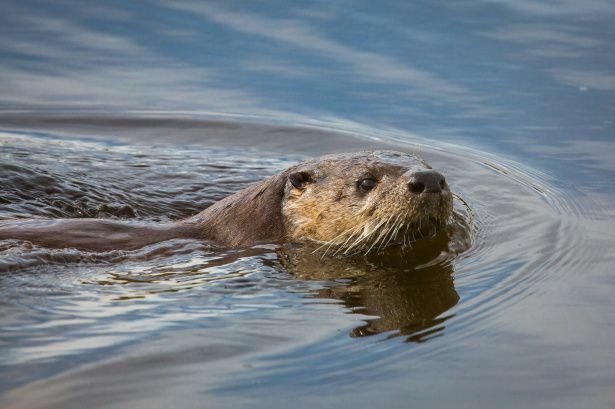 If the otter is surviving in an urban park, let her stay! As for the poor koi, they are a food source for all sorts of animals, and the people who put them in the position of being in an unprotected pond are to blame, not the otters or herons, who are only trying to survive.